Larne is steeped in maritime history, mainly because its potential as a safe haven for ships was recognised in ancient times. The first written reference occurred at the time of the Roman Empire around 205BC when it was reported by Emperor Serverus that a galley had sheltered in Larne Lough. In the 18th century Larne became a major steamer port for emigrants moving from Ireland to America, the State Line being one of the major shipping lines involved in the trade. The return journey brought imports of flax and tobacco from the new world. Coal imports were a major feature from the 17th century and continued until the 1970's. Larne became one of the first ports in the UK with dedicated roll-on roll-off ramps without needing fixed tide docks for cars and lorries in 1938, beating Dover by over 10 years. These ramps, built to serve the first purpose built ro-ro car ferry in Britain, the third named Princess Victoria, proved to be a major boon during the war. The redundant Dover train ferries were able to use them to ferry many tons of heavy military plant to and from the British mainland during the war. After the war Larne became one of the main players in the ensuing ro-ro revolution. P&O Ferrymasters, marketed as Pandoro, commenced ro-ro operations in 1975, switching from a purely lift on container service that had previously operated. 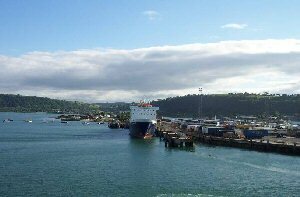 The Stranraer ferry route carried the bulk of the traffic passing through the port until the decision of the present operators of the route, Stena Line, to switch their operations to Belfast in 1995. The Bank Quay, situated on the tidal western shore of Larne Lough, has been closed since 1995 but in days gone by regular coal imports were shipped in through the Bank Quay along with other dry bulk cargoes such as china clay. It has been under the ownership of various fuel importers through the years and was a regular calling point for the Kelly collier fleet. The port, now owned by P&O, boasts up to 40 arrivals and departures a day to four ports and is regarded as one of the premier ports in Ireland.